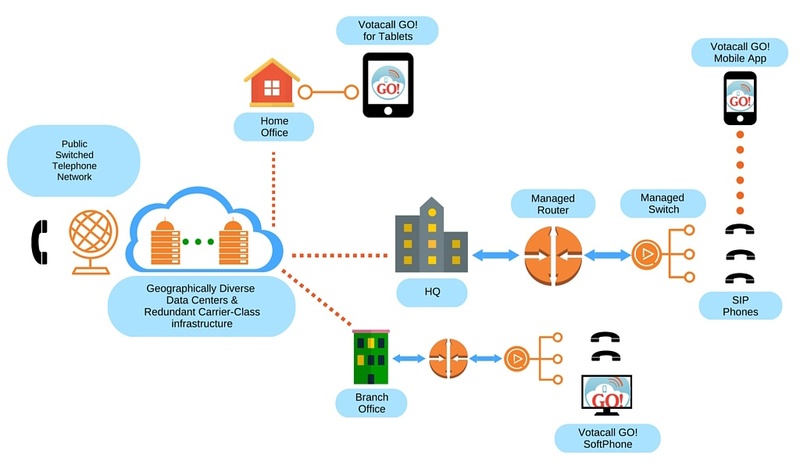 Ready to Move Your Business Phone System to the Cloud? Have you considered moving your Business Phone System to the Cloud? Have you already made the transition to the Cloud but are not satisfied with the results? If you fit into either category, then it's time to get to know Votacall’s award winning business-class Hosted VoIP Phone System. The Votacall Cloud Phone System is a feature-rich communication and collaboration solution that will position your business to get ahead and stay ahead of the competition. Stay connected from anywhere, at any time and from any device with Votacall. The Votacall Hosted VoIP solution has built in Business Continuity & Disaster Recovery capabilities, keeping your business communicating with colleagues and clients regardless of the circumstances. Whether it be a loss of power, inclement weather, fire, flood or natural disaster, Votacall's fully managed VoIP soluton will keep you in business. Think about your current phone system. Think about the expenses associated with it. Think about the business challenges it presents. With the Votacall Hosted PBX, you no longer need to think about it because that's our job. Our Cloud-based phone system is an all-inclusive, fully managed solution. What Does Fully Managed VoIP Actually Mean? In short, it means that Votacall is available 24/7 to provide hassle-free, on your schedule solution support at no additional cost. If you need programming changes made, Votacall will do it for you. Need help with your Hosted VoIP Solution? Votacall offers ongoing training and solution design sessions to make sure your business gets the most out of the cloud phone system. If you break a phone or any Votacall provided equipment, we will replace it. If your business suffers a critical issue or disruption, Votacall’s Hosted VoIP Phone System will automatically keep your organization up and alive in the Cloud and will re-route calls based on a pre-determined Disaster Recovery Plan. READY FOR A MORE FORMAL INTRODUCTION TO VOTACALL? The Votacall Hosted PBX Solution is designed to provide the ultimate business voice experience. The foundation for the Votacall Hosted VoIP experience is based on four key factors: Reliability, Scalability, Functionality and Flexibility. Leveraging an Enterprise-Class Cloud infrastructure that's located in geographically diverse Carrier-Class Data Centers, Votacall delivers an unrivaled voice experience for businesses both large and small with a local, national or international presence. Our Hosted VoIP Phone System offers the most advanced features and functionality available, including voicemail, auto attendants, multi-site connectivity, mobility, call center and more. This is not a DIY Cloud Phone System, the Votacall Hosted VoIP Phone System is the most comprehensive Managed Voice offer in the industry. We do the solution design and, once we coordinate and complete the implementation, our clients are handed off to our award winning Cloud Support Team only after you, the customer, sign off that you are happy with your solution. With Votacall, we focus on the customer experience; you focus on your business. As our taglines states, Votacall believes that you must innovate to communicate. The fast paced nature of technology and business in general validates this statement now more than ever. With Votacall’s Cloud Phone System, you gain the advantage of the Cloud backed by a Solution Provider that values innovation. Votacall customers benefit from unparalleled flexibility, so when your business needs to change, adapt, grow, or contract, your communications should go with the flow. The bumps, bruises, aches and pains typically associated with this type of change are a thing of the past. With Votacall and Hosted VoIP, you make your Communications work for your business, not the other way around. Votacall has the most robust feature-set to accommodate needs both present and future. SEE HOW THE CLOUD CAN WORK FOR YOUR BUSINESS. Discover how Votacall Hosted VoIP customers benefit from a cost effective solution with built in ultimate redundancy while keeping total control over their communications now and into the future. Click the button below to request a free demo and a member of the Votacall team will be in touch shortly!